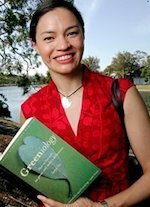 Tanya Ha is an award-winning Australian environmental campaigner, author, broadcaster, science journalist and sustainability researcher. She is an Associate at the communication agency Science in Public and the Melbourne Sustainable Society Institute at the University of Melbourne. She was an ambassador for National Science Week in 2009 and now, through Science in Public, is the national publicity manager for Science Week. At the University of Melbourne, she is part of the teaching group for the subject Human Behaviour and Environment. Tanya has worked in the media, advocacy, corporate communication and stakeholder engagement. Tanya was a science reporter for the ABC’s flagship science show Catalyst, and was the host and main reporter for the WIN Tasmania show Warm TV, for which she won the UNAA Media Award for Environmental Reporting. Tanya has also had roles in public policy and stakeholder relations, including over six years on the board of the state government agency Sustainability Victoria. Tanya now consults on science and environmental engagement and communication for several organisations, companies and research institutions. She is also a regular contributor to ABC Environment and has just commenced as a sustainable cities and business contributor for The Guardian.